Click here to find out more and choose your perfect bundle! Oooooh a Thunder Christmas song! How exciting. Release date 1st December 2017, but you can pre-order yours NOW! As announced on the Magnum Facebook page this morning, it is with a heavy heart that Harry will not be joining Magnum for their forthcoming performances. As demand for Thunder shows increases, this has inevitably lead to conflicting tour dates. Harry would like to wish all the best to Lee, who will be taking up drum duties for the up and coming shows and the recording of the new album. 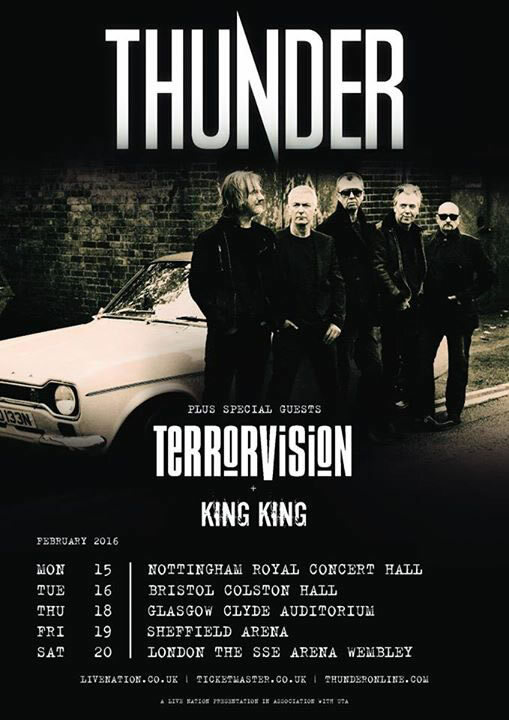 THUNDER TOUR IN FEBRUARY 2016! There are only a few days left to wait now until the release of Thunder's "Wonder Days", all sorts of promotional stuff going on, special performance, vidoes and sneak peaks, check out Thunder's facebook page for all the latest information! 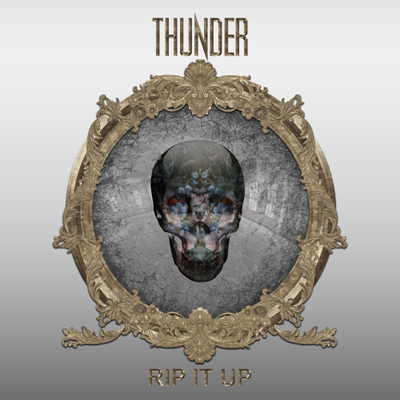 Thunder have confirmed that, six years after the release of their last studio album, they've recorded a new one! Out on February 16th next year. Woop! A video has been released for the title track "Wonder Days". Full details here or head straight over to watch it on youtube. Which is nice. Magnum are set to release a brand new recording of "On Christmas Day" (B-side "Born to be King". Available by digital download or beautiful limited edition vinyl from Amazon on 1st December 2014. New video from Magnum, perfect to get you in the mood for the current tour. Check out the gigs page for a date near you. 5th March - EXCITING THUNDER FESTIVAL APPEARANCE! Not only musiciansand freelance artists know this phenomenon: it’s impossible to deliver top creative performances at the push of a button. You need peace, leisure, and – most of all – a certain amount of serenity to create truly great works of art. “We used to be under permanent pressure from our record companies,” says Magnum mastermind Tony Clarkin. “They kept calling us, demanding hit singles and radio numbers. But that sort of thing doesn’t work on demand. Now we’re with SPV, where it’s a totally different situation. They give us the necessary time and trust us to do the right thing. That’s probably the reason why I enjoy working with Magnum again." melodies and Bob’s unique vocal style." single note, you never really know whether you’ll be happy with the result. March 25th in the US/Canada. edition with bonus DVD, as a double gatefold coloured vinyl LP set incl. bonus track, standard jewel case CD and download. set off on a huge European Tour (details on the gigs page). Reuben Archer's Personal Sin is out today featuring Harry and a host of familiar names. Get yours here. Here are all the details for the event on July 20th - a great event to support if you can get there. Happy Independence Day to all our American friends! 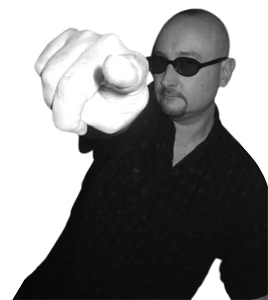 Harry will be joining Andy Fox live in the studio for the Thursday Rockshow, 9-11pm on GTFM 107.9FM or on the web at www.gtfm.co.uk and on BCFM 93.2 www.bcfm.org.uk. They will talk about Snakecharmer and all things Harry James. If you have a question you would like them to put to Harry you can email rockshow@gtfm.co.uk and don't forget to tune in next Thursday! 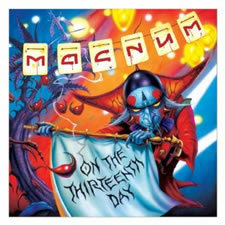 Magnum's latest album will be released in the UK on 24th September 2012. Various exciting formats are available, (full details on the Magnum website) and it's available for pre-order now! 15th September 2011 - Thunder Chrismas show finally confirmed! After much speculation (and delayed official announcements!) the Thunder Christmas show 2011 has been confirmed - 21st December 2011 at Nottingham Rock City. Danny and Ben will also hit the road in January 2012 with 8 special, intimate sit down shows which will feature stripped down Thunder classics, their favourite cover versions and stories of their years in the music business. Visit the official Thunder website for full details. No Thunder related update would be complete without news of Luke's fabulous new band (along with Chris Childs and Thunder friend Peter Shoulder) The Union. The boys have a new album out on 3rd October which you can listen to in full on their website and a tour in October. Check out The Union official website for more information. 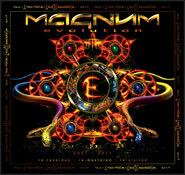 14th September 2011 - Magnum release "Evolution"
On 14th November 2011 Magnum are to release a exciting new album "Evolution". 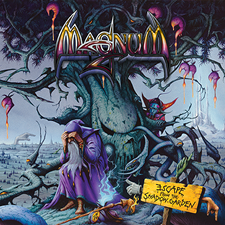 A celebration of the last ten years of Magnum since the reunion, the album contains partially rerecorded and fully remixed versions of songs from the comeback albums as well as two brand new songs. The band have also confirmed three exclusive live dates in the UK this November/December. Visit the Magnum website for full details and pre-order your copy now. 15th July 2011 - Top secret news! A cheeky little secret has emerged today that a band we all know and love will be special guests of Skin next Thursday (21st) at Nottingham Rock City. So get your tickets now before they all go! 1st June 2011 - THUNDER TO PLAY IN THE USA! Further to the news about members of Thunder's involvement in the Childline fundraising trip, the latest announcement from the Thunder website is that the rest of the members of Thunder and The Union will fly out to join Ben, Danny, Luke and Peter in the USA. Both bands will perform at the Sun Valley Pavilion in Ketchum on 16th July. The band will treat the show as a warm up for their High Voltage appearance on July 24th. For full details visit the Thunder website and don't forget to sponsor Ben, Danny, Luke and Peter if you can. 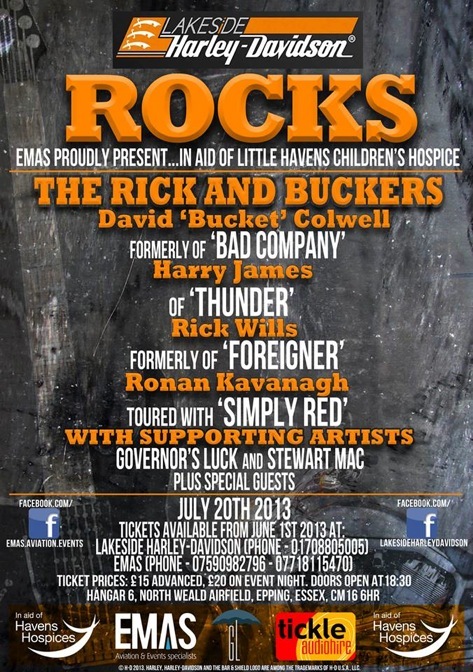 Some of Harry's Thunder colleagues are heading to Canada & America from 10th to the 16th of July 2011 to take part in the The Childline Rocks Hands Across The Water Ride. The team are also raising much needed money for Childline, so if you've got a spare quid or two, or to find out more about the trip click here. Fabulous news for Thunder fans today - Thunder will play a one-off reunion show at this Year's High Voltage festival! As the official statement points out, this does not mean Thunder are getting back together and Harry would like to underline his ongoing commitment to Magnum and he can't wait to get out on their forthcoming tour. Harry's involvement in his other projects also remains unchanged. I’ve been informed today that the ex members of Thunder have agreed to reunite after almost 2 years apart, for a one off show at High Voltage Festival, at Victoria Park London on Sunday July 24th. I’ve been asked to point out that this does not mean they’re getting back together, and there are no plans to record or release any new material. In fact Luke and Chris have asked me to stress that whilst they’re both chuffed to be doing a Thunder show, their commitment to The Union and the new album release (later this year) is undiminished, and the writing is going really well. All ex-Thunder band members’ other activities will remain unchanged, and Harry is about to go on tour with Magnum, so this really is a one off. Danny says: “I can’t lie, I’ve missed singing and being in the band more than I thought I would over the past couple of years, so when High Voltage called last week, I was keen to explore it, as it was great last year. We’re still releasing the new “Rough & Ready” live album, but there’s no plan to do any other recording going forwards. It will be great to play again, and we’re really excited”. Luke says: “I thoroughly enjoyed playing at the inaugural High Voltage last year with The Union so I'm really looking forward to getting together with the rest of the boys for a one-off reunion (no pun intended). Fortunately it fitted in nicely with everything else we're doing so in the end it was difficult to say no. I'm sure we'll have a lot of fun”. This is great news, I will of course be there, as I hope will you, but there is no more information, so please don’t bombard me for info on a new studio album, tour etc. If you haven't done so already, get yourself straight over to the Magnum website (on the main page, just scroll down a bit) where the band have treated us to an amazing official video release "Eyes Like Fire" as featured on the new "The Visitation" bonus DVD. Brilliant song, brilliant video featuring footage of Harry with the lovely Magnum boys in the recording studio and backstage. The latest Magnum album "The Visitation" is going down a storm with fans and critics alike so if you're not yet a Magnum convert, this is one to add to your collection and don't forget Magnum will be visiting a town near you soon (boom boom) so if you haven't already done so, check out the gigs page for details. 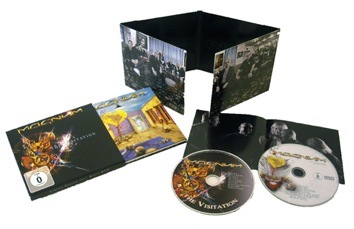 29th November 2010 -NEW MAGNUM ALBUM "THE VISITATION"
Release Date Europe: January 17th. Available for pre-order at Amazon. After a great deal of soul searching, I am very sad to announce that the rest of the band and I have decided to pull out of The 80s Rocked Tour. I’m not at liberty to go into the detail as to why, as there could be legal ramifications if I do. We are told by the organisers that the tour will still go ahead, with another band stepping in to take our place. We have no more information on this, so if you have questions or queries, I can only suggest you contact management at www.the80srocked.co.uk or via the Facebook page. We would like to send our most profound apologies to fans and ticket buyers for any disappointment and inconvenience caused by our non-appearance. This is not a decision we made lightly, we simply felt we had no choice. Harry, along with Thunder's Danny Bowes, have recently been in collaboration with old friend Dave “Bucket” Colwell, a musician who’s versatile career has led him from his early days alongside Iron Maiden’sAdrian Smith in the A.S.A.P project of the late1980s via a 14 year tenure with Bad Company, to his current undertaking: the album ‘Guitars, Beers & Tears’. Harry is the featured drummer on the album and Danny is featured on the song ‘Life’ which is due for release on August 17, 2010 on the AAO Music/Reality label in the US and Canada. Alongside Harry and Danny, Bucket also enlisted the help of a number of other notable musicians for this project including members of Iron Maiden, The New York Dolls, Bad Company, The Quireboys and Edwin McCain. For more information click here. Harry, along with five of the UK's most highly-esteemed and experienced rock musicians have joined forces to create Monsters of British Rock! Original Whitesnake members Micky Moody and Neil Murray have teamed up with Laurie Wisefield (Wishbone Ash), Harry, Chris Ousey (Heartland) and Michael Bramwell (We Will Rock You) to bring you classic twin-guitar based rock as it should be played. Playing classic rock songs that they helped create, such as Whitesnake's Here I Go Again, Fool For Your Loving, Don't Break My Heart Again, Ready An' Willing and Ain't No Love In The Heart Of The City, together with other hits from the band members' back catalogue, Monsters of British Rock are the genuine article. The list of world-class bands and musicians that the members of Monsters of British Rock have collectively played with runs into literally hundreds: Eric Clapton, Tina Turner, Joe Cocker, Jeff Beck, Gary Moore, Magnum, Queen & Paul Rodgers, just to name a few. This is one Monster of a rock band! Micky Moody - guitar, slide guitar, vocals; Neil Murray - bass; Laurie Wisefield - guitar, vocals; Harry James - drums, vocals; Chris Ousey - lead vocals; Michael Bramwell - keyboards. Harry is over the moon to be amongst such a prestigious line up of musicians and can't wait to start performing live with his new bandmates. Check out the gigs page. This year's fabulous Magnum tour has sadly come to an end but you can eek out the fun for a bit longer with the final instalments of the Magnum Moonblogs by following the links below. The pair of autographed drumsticks sold for the final amount of £103 which is a great amount raised for charity. Thanks to everyone who bid and made it such a great success. 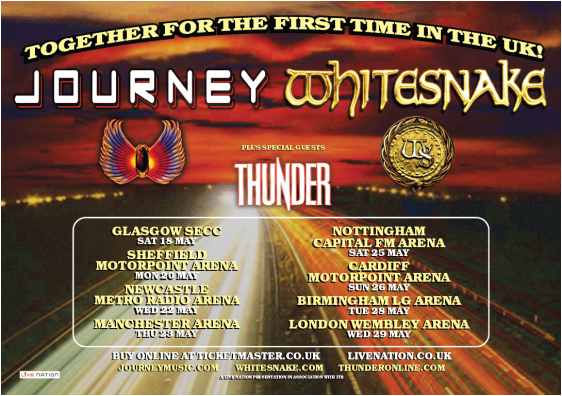 If you haven't already ordered your copy of Thunder's final show of the final ever UK tour what an earth have you been waiting for? Click here to order now from the Thunder shop. If you still need a little more persuading (but who would?!) check out the fantastic preview by clicking here. You can do your bit for charity and bag yourself a pair of genuine signed Harry sticks in a charity auction on eBay. Click here to bid or find out more about the cause here. Al Barrow, the bass playing multi-media wizard, has been keeping Magnum fans updated during their current European tour with a series of excellent video blogs available on Youtube. They're all a great snapshot of life on the road with Magnum and Moonblog 2 will be of particular interest as it features Harry and his shiny new drumkit. Check it out by clicking here. If you haven't already got tickets to a Magnum show, visit the gigs page tocheck out the dates and get it booked. 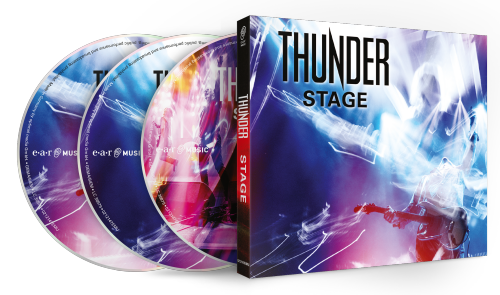 The cinematic evidence of Thunder's final show of their final tour filmed in London in July 2009 is now available to own on DVD. Get yours now. 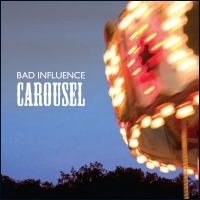 Bad Influence new album release "Carousel"
VAL COWEL, RICHARD HAYES, PETE STROUD AND HARRYJAMES will be playing a special gig at the Boom Boom Club, Sutton. They also have special guest Roger Cotton joining them on keyboards for this gig. They recorded the CD at Roger's "Roundel Studios" in Kent. The gig is to promote the bands' latest CD release "CAROUSEL" along with playing some of the old rocking favourites. They hope that you have this night available and that you can make it along to our gig. "Carousel" will be available to purchase on the night and at future gigs or you can buy online from Townsend Records. VENUE: "BOOM BOOM CLUB", Sutton United FC, Gander Green Lane, Sutton, SM1 2EY. The club is next to West Sutton BR station and there is also a large car park. Thunder have been nominated for the Classic Rock Band of the Year category at this year's Classic Rock Awards. It's a fan voting system so show Harry and the boys how much you love them one last time and click here to Vote for Thunder!. The winners will be announced November 2nd at the Hall Of Fame Awards. 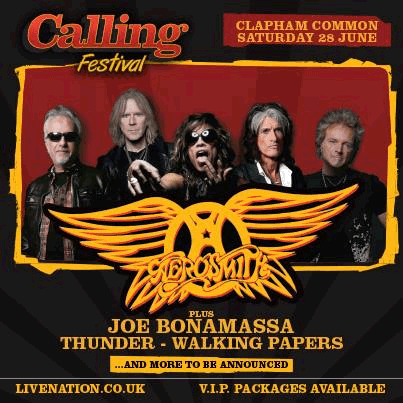 The last ever Thunder gig will be a very special performance at the Sonisphere festival. See the gigs page and the Thunder website for more details. Thunder's "20 Years and Out" tour of the UK kicked off in Glasgow today. Luke, Ben and Danny stopped off at Rock Radio Soctland for a little acoustic performance. Watch the video here. Into the Valley of the Moonking, the fantastic new Magnum album featuring Harry on drums is out now. Click here to order your copy. While you're in a buying mood, complete your Thunder collection with live recordings of selected gigs from their final tour. Pre-order now or pick one up on the night. Very clever.